Pakistan: Menace of One Wheeling has been at rampage in our big cities like Lahore, Karachi, Islamabad, Rawalpindi, and others, but now this curse has become an epidemic in small cities and even in villages as well. Any special day like Independence Day, Eid Days, Chaand Raat, New Year brings the tragic news of scores of casualties of youth because of one wheeling accidents. Countless measures have been taken by Police Department to curb this lethal trend but everything went in vain In front of thrill of one-wheeling among young lads. Wheelie-doers resort to other stunts also like lying flat on the bike, inverse driving, racing and juggling while performing these stunts. These adrenaline junkies are mostly in teenage or in the early 20s. They don’t have any idea that how precious their life is! Many of them have seen their friends in pools of blood because of some fatal accident while performing these stunts but most of them don’t learn any lesson from such tragedies. Even Traffic Police Officials could not nab these hooligans for their nuisance activities because they have immense control of their bike even at high pace, especially on National Holidays when they pour in hundreds and thousands on the busiest roads of cities. These wheelie-does have links with Mechanic Mafia from where they get their bikes altered illegally for one-wheeling and racing. With dazzling lights, mostly without silencers and number plates, adorned in different colors, these bikes can be spotted easily roaming in cities. There are a lot of grim stories of deaths from one-wheeling, racing, and other stunts. Besides deaths, a large number of guys have suffered permanent disabilities also. I still feel pain in remembering the stories of two bikers who died in different accidents many years ago, because of these deadly stunts and racings. One was Sabih from Lahore, who died while performing stunts on his 125cc bike, and the other was a heavy biker from Lahore who died midnight while racing. The favorite slogan of that heavy biker was “Life begins at 240 kmphr”, and his fellows at that tragic night say that he was driving probably at the same speed but his life ended at that speed. I am really sorry if someone gets hurt by recalling these sad stories. The only purpose of mine is to save our youth from such tragedies. Regarding Sabih, his parents showed immense courage after his death to allow a private channel to complete a documentary already being shot in his life, just to save sons of other mothers. That documentary “Sabih Ruka Nahi” shows his real-life scenes and his funeral also. This documentary brings viewers to tears. I wish that all wheelie-doers must see that documentary at least once. 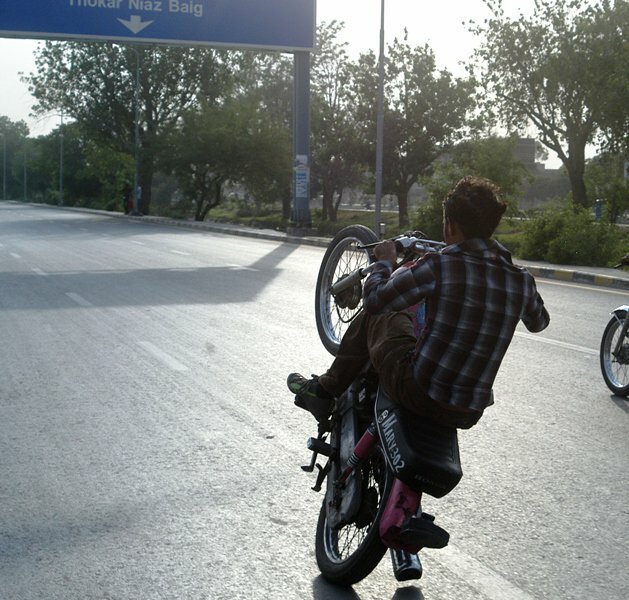 On every special occasion, Traffic Police Officials adopt different tactics to counter these wheelies. They impound their vehicles in hundreds and haul in many such motorcyclists but these bikers dodge them mostly because of their fearless driving skills.A few wheelies also indulge in criminal activities in order to get money to fulfill their passion. Just a few months back, a traffic warden was shot and injured in Rawalpindi while attempting to stop wheelies. Different campaigns on part of Traffic Police and Civil Society have been launched for awareness of ramifications of one-wheeling but these have been proven insufficient to eradicate this menace. Without strictness from Parents, our youth can’t be stopped from this death game.Parents should not show any flexibility in this matter because bike on one-wheel also shows no flexibility for life.